Much to the Hubs dismay I want to redo our living/dinning room. All new furniture - couch, chairs, tables, console...you name it! I may have mentioned this once or 500 times before... :) I talk of it often and have pretty much predetermined all the pieces we need to make it perfect! (Such a girl right?!) Alas, I'm receiving some resistance but I have an idea on how I can update our pad for the time being. OH that sounds like a great idea! DO iT! So fun! I say go for it! Yes you should definitely do it! Love the idea! Sometimes, something as simple as updating my throw pillows makes me feel better about our space! My fiance and I talked just yesterday about rearranging furniture because I'm so bored of our living room. Unfortunately we came to the conclusion that it only works the way we have it. This would be a great little change! I loveeee chalkboard paint! love the frame over the painted wall. SUCH a good idea! 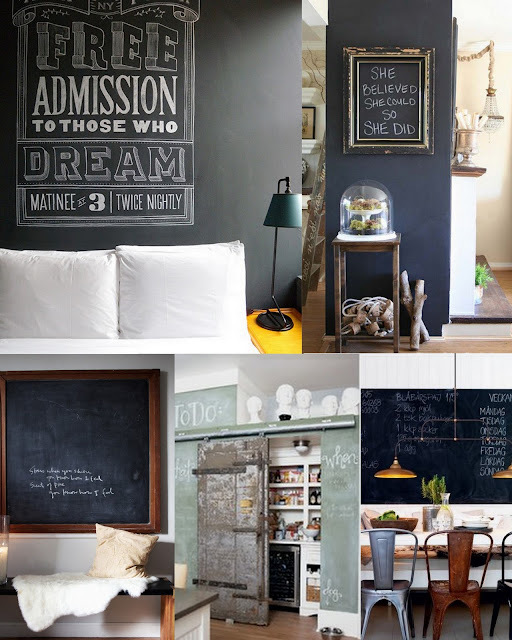 I'm obsessed with chalkboard paint.....go for it, you'll love it! Plus you can always paint over it. I can't WAIT to see your photos -- I've always wanted to do this! LOVE chalkboard such a great way to add some zest to a space. love chalkboard paint! so fun! um...this is a brilliant idea! PICTURES fo sho! Do it!!! I love chalkboard accents! I have been dying to add one in my house since I moved in! That sounds like a great project! Do it! Pleaaase do it! Absolutely love... such a brilliant idea!!! I paint that same size wall in our house with chalkboard/magnetic paint & i lurvvee it! Its not as fancy & more fun since i put a montly calendar up there, notes & to-do's. If you dont want the commitment of paint they do have chalkboard contact paper that is easily removable! Beautiful inspirational spaces. Make me wanna start decorating.